As of yesterday, January 13th, I’ve trialed 18 new-to-me recipes this year! That doesn’t count the numerous, and I mean many, recipe re-tests to get things just right. In fact, these Triple Peanut Butter Cup Bars took me several tries. Every batch was delicious, but some were too crumbly, some a little too sweet, but these are just right for all of you pb-aholics out there. 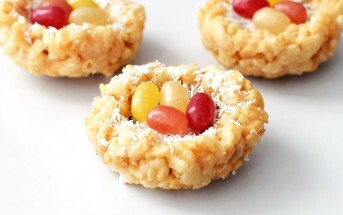 Oh, and yes, you can make them with almonds or even nut-free – options included! 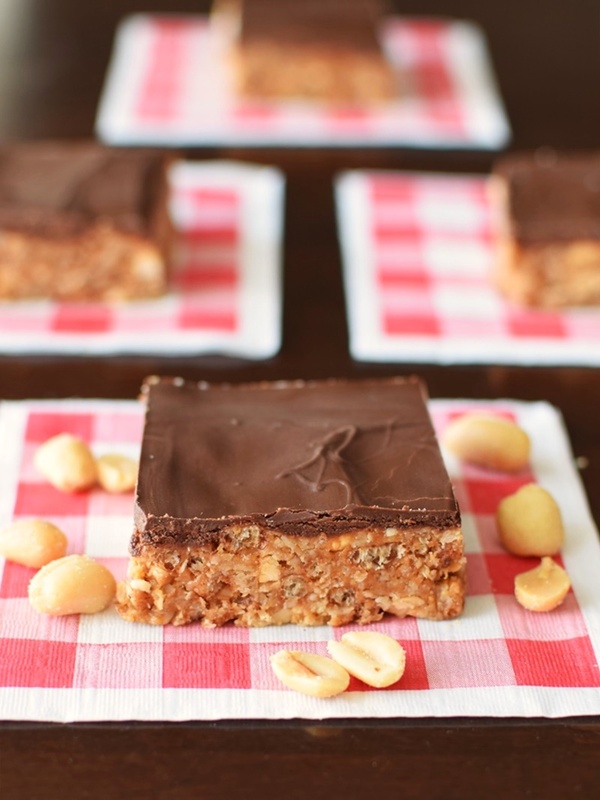 These triple peanut butter cup bars are a success from my personal 365 New Dairy-Free Recipe Challenge for 2016. My goal is to trial at least 365 new-to-me recipes this year, and that doesn’t even count all of the retesting I am doing to perfect many of those dishes. I’ll be using the hashtag #365dairyfree here and on social media to share many of the trials, successes and flops! Just barely eeked in my one per day! I need to up my game in the weeks ahead as I have some travel sneaking up. The ones noted as “Sun Basket” are a prize I won for a healthy recipe / food delivery service (most of what we got was paleo!) where they send you the ingredients and a recipe to follow. It was fun to try out and got me to experiment with some new dinner recipes – man were those salads big! By ingredients, this recipe is dairy-free / non-dairy, egg-free, gluten-free, soy-free, optionally vegan / plant-based, and vegetarian. 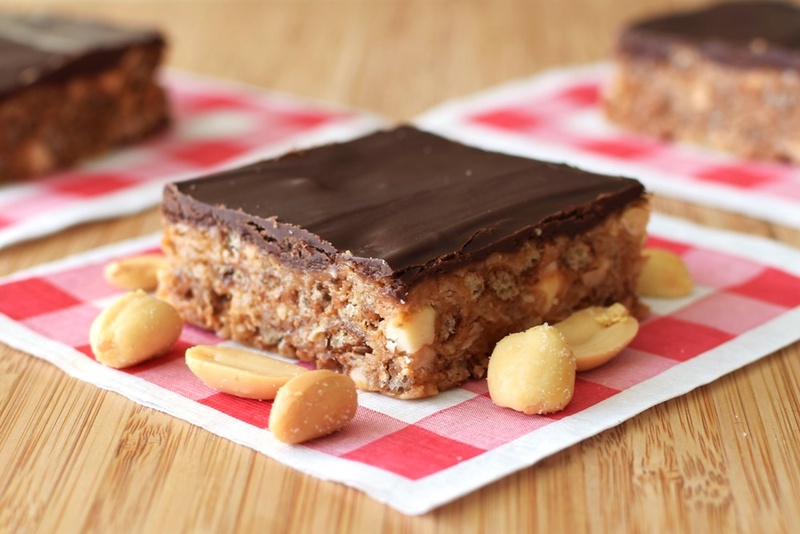 For peanut-free almond butter cup bars, substitute almond butter for the peanut butter and use sliced almonds in place of the peanuts. 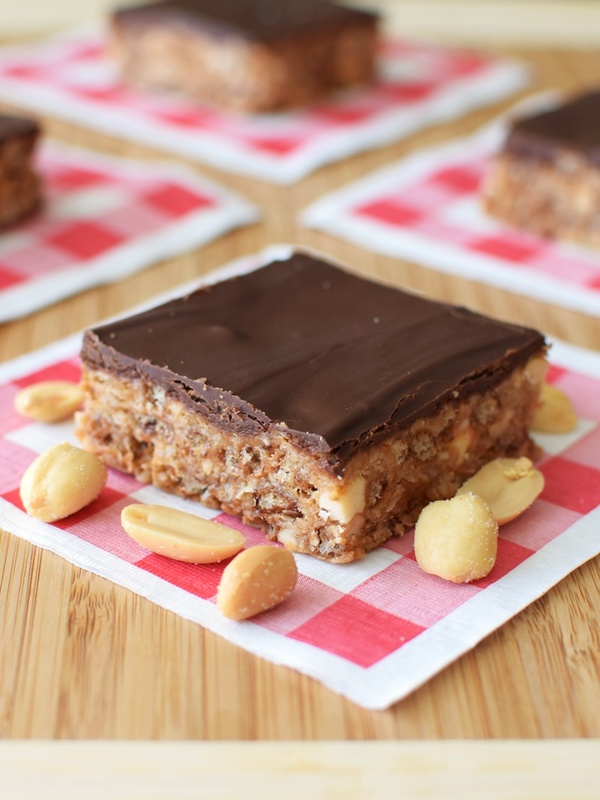 For nut-free sun-butter cup bars, substitute sunflower seed butter for the peanut butter (most versions will make them a little sweeter) and use another 1/2 cup of the crispy rice cereal in place of the peanuts. For less nutty peanut butter cup bars, swap a simple melted chocolate drizzle or glaze for the peanut butter-chocolate frosting. Optionally swap the peanuts with 1/2 cup of additional crispy rice cereal. Place the honey in a medium pot over medium heat. Bring it to a simmer and let bubble until it reaches about 245ºF (give or take 5 degrees), about 3 minutes. Remove the pot from the heat and stir in ½ cup of the peanut butter and the coconut oil until smooth. Stir in the crispy rice cereal and the peanuts. Stir in 1 cup of the quick oats. Stir in additional, as needed - I usually end up using 1¼ cups, but you might want to pack in more. All bits should be nicely coated. Press the mixture firmly and evenly into a greased 8x8-inch dish (do not use coconut oil to grease it!). Place the dish in the refrigerator to cool. Place the chocolate chips and the remaining 3 tablespoons peanut butter in a microwave-safe dish. Microwave on HIGH for 30 seconds. Stir and microwave another 30 seconds on HIGH. Stir until smooth. If not fully melted, heat in 15 second intervals, stirring in between, until just melted. Remove the bars from the refrigerator and pour on as much of the chocolate-peanut butter mixture as you like. You may have extra. Place the dish back in the refrigerator to set up, about 20 minutes. Cut into squares or bars. Store in an airtight container at room temperature for up to one week (they will be softer but should be cohesive), in the refrigerator (my favorite, I like them chilled), or they can be frozen. If frozen, let warm up a few minutes before digging in - they get a little crispy! *Almost any liquid sweetener should work well - non-GMO light corn syrup or brown rice syrup are two options. **If you want just a thin coating of the chocolate-peanut butter topping, reduce the ingredient amounts in the topping to 2 tablespoons peanut butter and ½ cup chocolate chips. Do you have any suggestions for things that can be subbed for the coconut oil? We unfortunately have an allergy in our house. I’m super excited to try this and share with all of my peanut/pb addicts! Thanks in advance! The coconut oil just helps them firm up a bit more when chilled. You can use palm oil or add more peanut butter (they’ll just be a little softer). Thanks Sonali! The cod was a tasty concept and I loved the flavor, but I think the fish we received had been previously frozen (so gummy!) and the recipe was a little “chef written” in terms of missing some details (made on the fly), but I loved the idea and will certainly be trialing again. 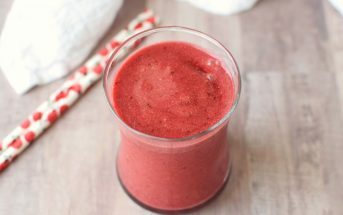 Happy to share the recipe with you! These look absolutely amazing! So much better than the traditional peanut butter desserts! Oh my word. These look amazing! I think I may make these this weekend!! My husband has been devouring them for breakfast! I froze some that he doesn’t know about for myself. These look so good, and I really appreciate all the testing you put into the recipe. Can’t wait to try them. Yum! Peanut butter and chocolate are the best combination! I definitely want to try these! Oh I can’t wait to try that cereal! I have never heard of them but with my diet those are perfect! Peanut butter bars are the bomb and never last long in my house! It is a fantastic brand of cereal Jennifer. They have lots of varieties – we’ve tried them all. Tasty and wonderfully nutritious, especially for cereal! Congrats!!! I can’t wait to see the biscuits and gravy recipe! And thai turkey salad….YUM. Neither do I! I think you’re going to love the gravy recipe Katie, right up your alley. Haha, that would be nice! My husband loves them but then curses me for all of the sweets he can’t resist! These bars look delicious! Love that layer of chocolate fudge on top. Can’t wait to see some of the recipes for the recipes you tested this week – the coconut braised cod sounds especially delish! Thank you Jessica! The cod food / recipe was from Sun Basket and truth be told, the recipe didn’t work out super well. I think it was written by a chef – haha. That said, I loved the flavors and it has made me want to trial and perfect it! Garam masala with white fish was surprisingly amazing. Oh, how interesting! I really hate when I spend the time trying a recipe that’s published and it doesn’t work. They should hire one of us instead!! I’d lick the screen if I could!!! Triple PB…drool!! And these don’t look nearly as hard as i thought! Wow, you are on a roll! I wish I could say I was even half as prolific in the kitchen lately… Or even a quarter, at that. These bars look like real winners, too! Thanks Heather, they really were and I was so determined! Anything with peanut butter floats my boat. I’m just in love with this recipe, Alisa. I have to try these. I’m with you Florian – I didn’t like peanut butter as a kid, but as an adult, I can’t get enough!